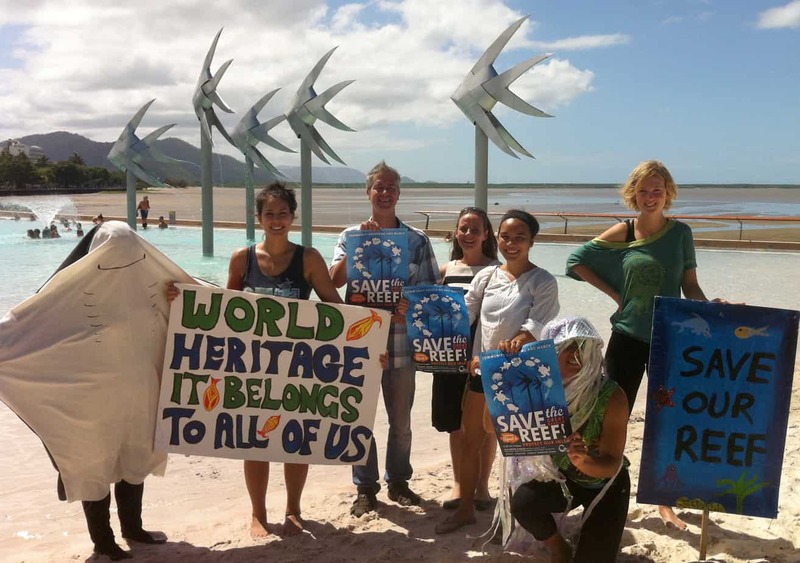 Late last year the Cairns and Far North Environment Centre (CAFNEC) released a survey to assess community opinion on the current and future environmental health of the Great Barrier Reef (GBR). The survey was undertaken by 843 members of the regional community at stalls in Cairns Central, at markets and via the CAFNEC website. Compared to 10 years ago, what is the current condition of the GBR? What is your level of concern on 12 potential threats to the GBR? 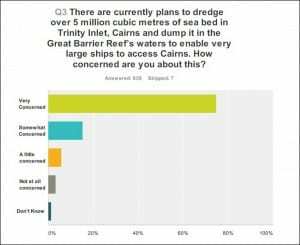 What is your level of concern on a proposal to dredge over 5 million cubic metres of the sea bed in Trinity Inlet (to expand the shipping channel) and dump the dredge within the GBR World Heritage Area? 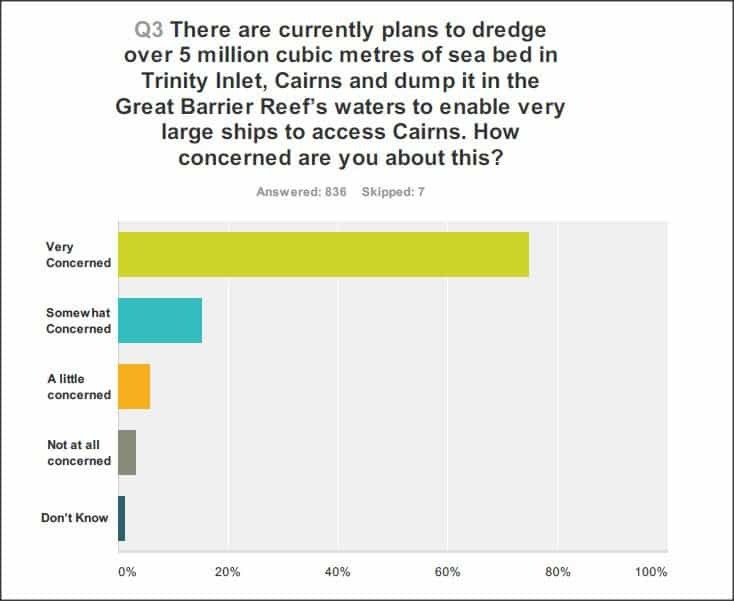 85.5 % of respondents supported a ban on dumping of dredge spoil in the GBR. When faced with providing an opinion on 12 separate threats to the reef, the highest level of concern was expressed on industrial chemical pollution, construction of ports and dredging, farm pesticide pollution and illegal poaching of wildlife. Of least concern was tourism and storms/cyclones. The GBR is World Heritage listed for its outstanding environmental and cultural heritage. 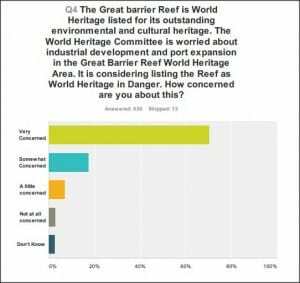 The World Heritage Committee has expressed concern about industrial development and port expansion in the Great Barrier Reef World Heritage Area and is considering listing the reef as World Heritage in Danger. When participants were asked how concerned they are about this 70% said they were very concerned, while only around 5% were not concerned or ‘don’t know’. What will we be doing with the results? 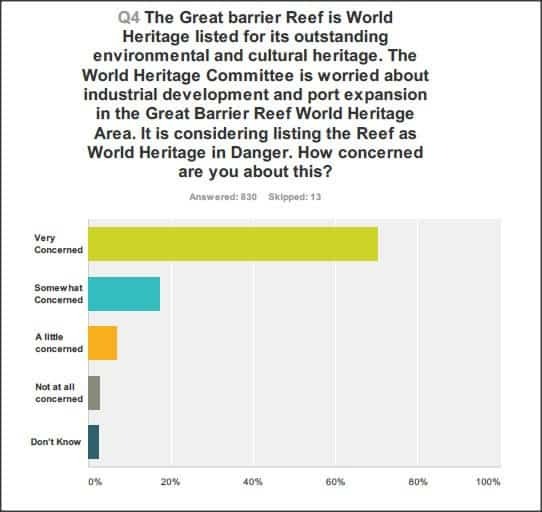 Now that the survey is completed we will use the results to highlight important issues, follow up to inform concerned community members on the conservation priorities for our region and forward people’s concerns to politicians. We would like to thank the following individuals and businesses who supported the survey with prizes or other assistance. Concerned community member and businesswoman Caroline Emms who helped with printing costs and so much more. The many volunteers who gave their valuable time to distribute the survey – you are all wonderful. Cairns Central for donating use of a table in the centre for us to conduct surveys. Thala Beach Lodge – for their generous prize donation. Reef Magic Cruises – for their generous prize donation. La Fettuccina – for their generous prize donation. Edge Hill Newsagency – for their support. All the people who participated! !